The Fourth of July is right around the corner and there's plenty to do in north Texas to celebrate. The annual Bluegrass on Ballard event happens from 10 a.m. to 10 p.m. Saturday in downtown Wylie. This free festival includes live music, a car show, arts and crafts for the kids and lots of food. Main Event offers all-you-can-play passes in honor of Fourth of July. Parents and kids can play golf, laser tag, billiards, bowling, a gravity ropes course and rock climbing (check location for activities) for as little as $12.95 per person. 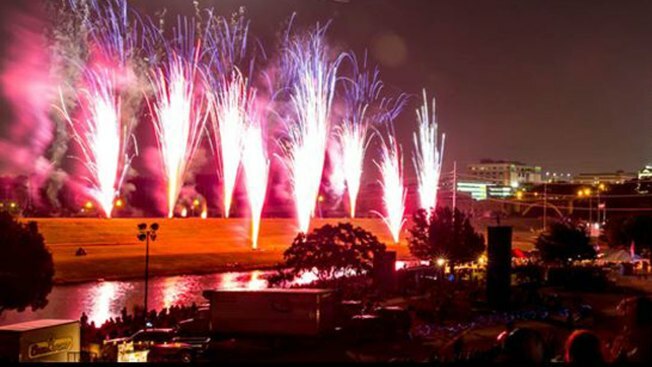 Kaboom Town in Addison is packed with plenty of fun activities during its free festival Monday, including food, live entertainment, a carnival for the kids and a top 10-ranked fireworks display at dusk. In the heart of Dallas, the Fair Park Fourth event kicks off at noon Tuesday.Tickets are $7 and the fireworks show starts at 9:45pm. The annual Fort Worth Fourth celebration will take place at the Panther Island Pavilion Tuesday. The free event includes food, tubing, zip-lining, pony rides and live music from the Tejas brothers and Party Machine. Gates open at 2 p.m. and the fireworks show starts at 10 p.m.
We also have a list of Fourth of July fireworks shows scheduled all around the area. Check them out here.